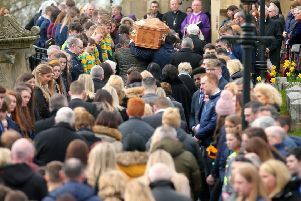 A blood sample revealed that a 20-year-old man has drugs in his system when he was found sitting in the driver’s seat of a car, Banbridge Magistrates Court heard last Thursday. Andrew Carey, Ballynadrone Road, Magheralin, admitted being in charge of a motor vehicle on November 21 last year while unfit through drink or drugs. The court heard that at 1.40am police found the defendant sitting in the driver’s seat of a car on the Lurgan Road, Dromore. He appeared to be drowsy, was unsteady on his feet and the pupils of his eyes were dilated. Police suspected he was under the influence of drugs and a blood sample was taken. This showed that he had cannabis, Diazepam, Tiazepam and Ecstasy in his system. A solicitor representing Carey said he had taken drugs on Friday night but nothing on Saturday and he was detected on Sunday. He added that the defendant was now attending a referral clinic in relation to drug abuse. The solicitor said he was a hard working young man who travels to his work and his licence was essential to him. District Judge, Mr Paul Copeland, told Carey he was ‘reckless and irresponsible to get behind a wheel in his condition’. He fined him £300, ordered him to pay a £15 offender’s levy and banned him from driving for four months.